Born and raised in Holdrege, Nebraska, George Lundeen went to college at Hastings, and then went on to the University of Illinois for graduate work. A Fulbright-Hays Scholarship sent Lundeen to Florence, Italy for a year where the works of the old masters inspired his ambition to sculpt for a living. Today, George lives and works in Loveland, Colorado. George is honored to have been the sculptor of several pieces made specifically for Nebraska. The Players is located at the University of Nebraska Field House to commemorate the National Championship Women’s Volleyball team. He created the Native Nebraskan Award for the National Football team. Portrait busts of several Nebraska Senators have been commissioned to display in the Nebraska Hall of Fame in the State Capitol Building. A portrait of George Norris was commissioned by the Nebraska REA in recognition of Norris’ many contributions to the state and the nation. He is currently working on maquette for a piece depicting Mari Sandoz for Chadron State College. 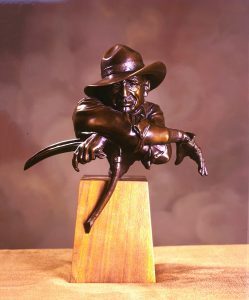 George Lundeen’s sculptures can be found in collections throughout the world. He has been the recipient of many awards from organizations which include the Allied Artists of America, the National Academy of Design and the National Sculpture Society. He has also received an honorary degree, “Doctor of Humane Letters”, from the University of Nebraska.